First Panel: A story taken from "the Life of St. Colman" in the library of Rennes in Brittany. Coleman mixes his barley with the king's wheat and turns the wheel backwards. He gets the ground wheat. Third Panel: their barley to the mill where the king's wheat is being ground. The miller refuses to take his barley. Fourth Panel: The king gets the ground barley. The place was called "The Lefthand Mill", "An Muileann Cearr", Mullingar. 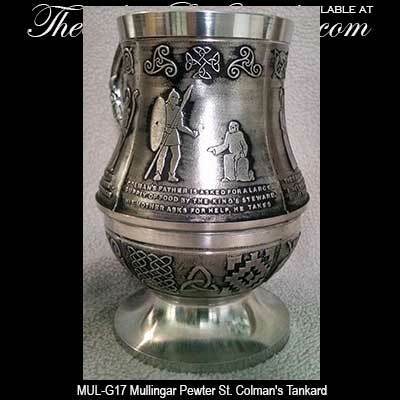 This Celtic tankard features a story taken from The Life of St. Colman embossed on the pewter panels. 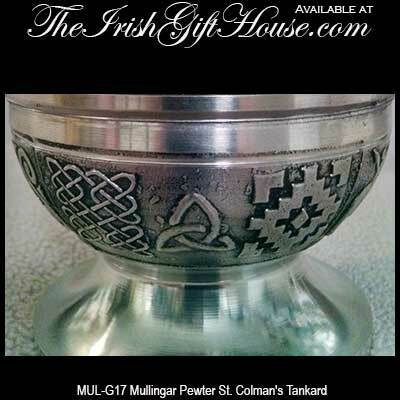 The pewter Irish tankard is enhanced with Celtic knot-work both on and under the panels and it is further enhanced with a footed base along with an embellished handle. 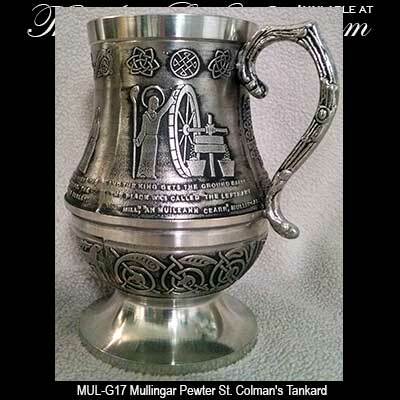 The St. Colman tankard measures 3" wide at the rim x 5 1/4" tall; it holds 15 ounces. 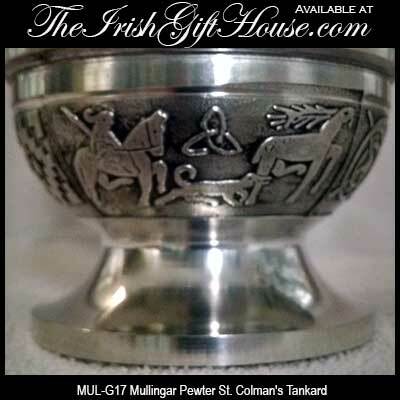 The Irish saint tankard is made in Ireland by Mullingar Pewter and it is gift boxed with a Celtic knot history card, complements of The Irish Gift House. 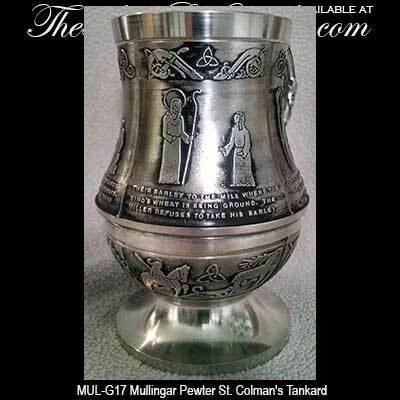 Saint Colmán mac Luacháin was an early Irish abbot (7th century), founder and patron saint of Lann (Lynn, Co. Westmeath, Ireland). A Middle Irish Life was written for him in the 12th century, possibly soon after 1122, which is preserved in a single manuscript kept in the Rennes Library in Brittany. 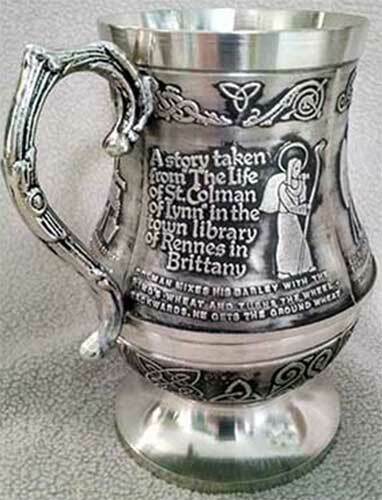 According to the Annals of Ulster, the 22nd of March (Spy Wednesday) in 1122 was the day when the saint's shrine was discovered in the burial place of Lann. Kuno Meyer, who edited the Life, suggests this event may have prompted the composition of the text shortly after 1122 and also argues that there are linguistic grounds for assigning the text to the 12th century. The frequent use of such locational adverbs as sund ("here") seem to indicate that the Life was also written at Lann.